Rick Griffin is a Southerner with a thirst for adventure, while Sandi McKenna is a Northerner who leans towards leisure. 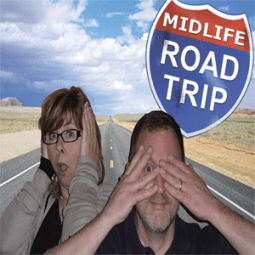 On their Midlife Road Trip journeys, they almost always have differing ideas as to how to best experience a destination. Here’s their “his way/her way” look at Las Vegas—it’s one fun destination with two views. While Las Vegas is famous for headlining celebrities and spectacular shows, I prefer doing something that doesn’t involve me sitting on my rear end inside an auditorium. There are a number of helicopter tours available for seeing the city, Hoover Dam, and the Grand Canyon. Dig This is a mock construction site that allows you to operate heavy-duty excavation equipment. At 550 feet high, the High Roller Observation Wheel provides spectacular views of the city. I like nice things, so when I plan a trip, I make sure it includes the finer things in life. It’s not that I am adverse to getting dirty, in fact, some of my favorite spa days have included mud wraps. My day starts by detoxing from the Las Vegas nightlife at the Canyon Ranch SpaClub located on the third floor of The Palazzo and the fourth floor of The Venetian. Nothing breathes new life into a middle-aged body like an oxygen facial, a nourishing cocoon wrap, and an organic baby kale and apple salad with an antioxidant smoothie shot. Refreshed and rejuvenated, I’m off to the Grand Canal Shoppes to visit with Jimmy Choo, Tory Burch, Christian Louboutin, and the like. I end my night sitting ringside, watching one of Vegas’ headliners—Britney, Celine, Elton, or Olivia. Viewfinder Tip: Purchase tickets for activities well in advance as they tend to sell out. I don’t look at gaming as gambling. I look at it as making donations to casinos. I don’t care for slot machines because A) I don’t understand them, and B) there’s no real strategy that I can employ to increase my chances of winning. I’ve had the most success and fun playing roulette. The minimum bet size for most casinos on the strip seems to be around $10. But if you venture just one block off the strip to the Westin, you can make casino donations at the rate of just $1 per spin during the afternoon happy hour. I’m not big on gambling, for two reasons. One, I’m not fond of math and/or numbers and two, I don’t like to lose money. Then, I was introduced to the Willy Wonka penny slot machine. It’s more like entertainment, with clips from the original movie Willy Wonka and the Chocolate Factory with Gene Wilder. Music plays, the Oompa Loompas appear along with other cast members, there are bonus rounds and golden tickets. You almost forget it’s gambling. Several years ago I had my first taste of Lobster Gnocchi in a black truffle cream sauce at Fiamma Trattoria & Bar at the MGM Grand. Apologies to Amy Vanderbilt and Miss Manners, but it was so good I actually licked the plate. It has since become one of my Las Vegas rituals. While Rick may be flying high above the strip, I’m not one to sit idle either. I can’t think of a better way to combine physical fitness and my love of food than with a dessert crawl to a destinations best bakeries and patisseries. Expedia offers one in the afternoon and is a fun way to try a variety of sweets. But, after dark, it’s Big Eye Tuna Pizza, Seared Foie Gras, and Lobster Carpaccio. They are just three of the reasons Yellowtail is on the top of my list of Las Vegas dining spots. Yellowtail also has an extensive saki list, views of the magnificent Bellagio dancing fountains ,and is a favorite eatery of A-list celebrities. Since Las Vegas has so many amazing properties, I like to stay somewhere different each time I visit. But if you’re on a limited budget and you don’t mind walking through an alley between a liquor store and a tattoo parlor, I recommend the Travelodge Las Vegas Center Strip. It’s not pretty, it’s not new, it’s not glitzy, and for a property that’s technically located on The Strip, it’s not particularly convenient. But it is cheap. Rooms come with a bed, a toilet, a shower, a color television, a window unit air conditioner, and free Wi-Fi. What more do you need? Save your money for gaming, eating, and bucket list activities. Besides, one can experience the amazing Vegas properties without having to stay there. But if you have a great day in the casinos, you can always upgrade to a suite in Caesar’s Palace. A strip view suite at the Mandarin Oriental is my choice for sleek accommodations with spectacular views. Let’s face it, in Las Vegas, you want to feel like a high roller. Who can resist goose down bedding, maid service twice a day, plush robes, Atelier Cologne amenities, and chic decor with an elegant, subtle color palette? Certainly not me. The Las Vegas Strip, dare I say, can be a tad tacky. You will find none of it here. The Mandarin Oriental is 47 floors of smoke-free and non-gaming, five-star luxury at its finest. What’s your favorite way to experience Las Vegas?